You should never pass up an opportunity to bomb. The new Star Trek movie is out and we're seeing a bunch of new players from around the world. Netrek now has a Google mailing list, http://groups.google.com/group/netrek-forever. Join up! If you have news for us, don't hesitate to contact us. You can browse the news archive for past items. Webmasters: Netrek Webmasters Comments and suggestions as well as articles are welcomed! For anyone wanting to donate to help pay for the current download.com listing, please click on the button below. Thanks! Advertise your netrek page on this site! Submit us your 468x60 banner and an url! The picture above is pretty close to what a Windows or Linux user will see. The mac client looks a bit different. How to send Messages: Type 'm' or put your mouse cursor in the outgoing message window. On the Windows and Linux clients, it is the upper of the two thin one-line windows labeled "Typing" in the above diagram. 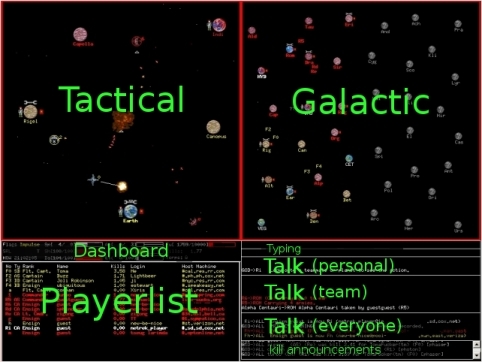 This will be right below either the galactic or the tactical screen in most layouts. 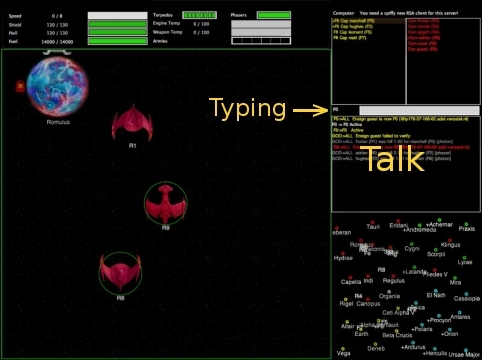 MacTrek has a text entry box in the middle of the right side of the screen. Type now your message followed by enter. Use the Esc key to cancel a message before sending it. and an "All" message by putting the pointer in the "All" window. In Windows clients, you can start a message to a player by putting your mouse pointer over that player's entry in the playerlist window.